LOW-cost carrier AirAsia Philippines promised to add frequencies to destinations in North Asia to sustain airline operations. AirAsia Philippines chief executive officer Dexter Comendador on Friday, Feb. 8, said they will be adding frequencies to Cebu-Taipei and Cebu-Incheon. “Our strategy is to increase international routes rather than domestic flights because the latter has seasonality,” said Comendador. Comendador said Filipinos travel less during the rainy season or in the months of June to September. Starting Feb. 8, AirAsia Philippines will fly daily from Cebu to Macau. This is the airline’s sixth international connection linking the province to China after Kuala Lumpur, Singapore, Incheon, Schenzen and Taipei. AirAsia leaves Cebu at 9:25 a.m. and arrives in Macau at 12:15 a.m. It departs Macau at 12:45 p.m. and arrives in Cebu at 15:25 p.m.
“We are delighted to welcome the New Year with our newest international flight from Cebu to Macau. We are here to provide connectivity, excellent service, unparalleled low fares, and safe and reliable airline service that every Cebuano, every traveler truly deserves,” said Comendador. He stressed that China is an important market for AirAsia and that it is a fast-growing market. “We are increasing our overall capacity to China,” he said. 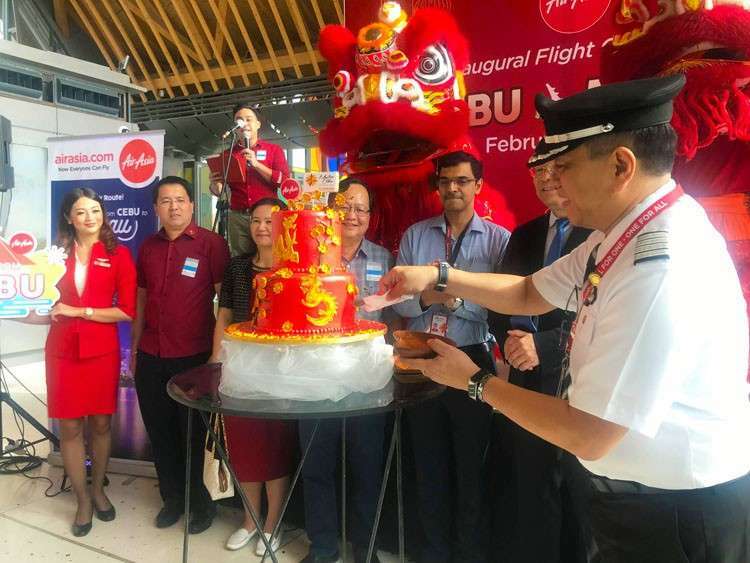 AirAsia picked Macau as its newest connection for Cebu because based on their market study, “the Las Vegas of Asia” is now the gateway out of China for tourists. “It’s not Hong Kong anymore. Most Chinese in the southern part opt to move to Macau to travel to southeast Asia,” said Comendador, adding that Hong Kong too, is now crowded. As a destination, Macau is packed with entertainment centers and theme parks. The island, which has a good blend of Portuguese and traditional Chinese culture, also boasts of 25 world historical heritage sites such as the famous ruins of St. Paul’s that was built in the 16th century. Moreover, the addition of Cebu-Macau in AirAsia’s destinations is also seen to boost Chinese arrivals to Cebu and to neighboring islands. Cebu Chamber of Commerce and Industry president Antonio Chiu said the increasing presence of international flights to Cebu reflects sustained investors’ confidence in the province’s economy. It also opens up economic opportunities in trade and tourism. Moreover, Comendador said they are also marketing Cebu and Panglao together because these are two important entry points in the Visayas. The airline is also in constant discussions with the GMR-Cebu Airport Corp. on the latter’s expansion plans for Mactan-Cebu International Airport, such as the addition of more terminal spaces and the construction of the proposed second runway. The Philippines welcomed 1.2 million visitors from China in 2018, the most improved market at an impressive 29.62 percent growth rate, according to the Department of Tourism. As a group, AirAsia operates 550 weekly direct flights from its hubs in Malaysia, Thailand and the Philippines to over 20 cities in China.